As Hosted PBX providers, both 8×8 and RingCentral do much more than provide just a phone number and dial tone. 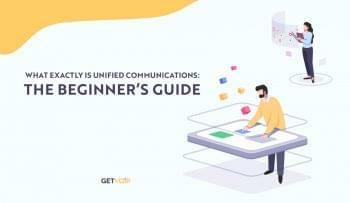 Each company provides extra features bridging into a Unified Communications platform to expand your capability to more than just voice calls, but also video chat, business SMS and text chat between phone lines and even the ability to make calls from any device anywhere – not just your desk phone. 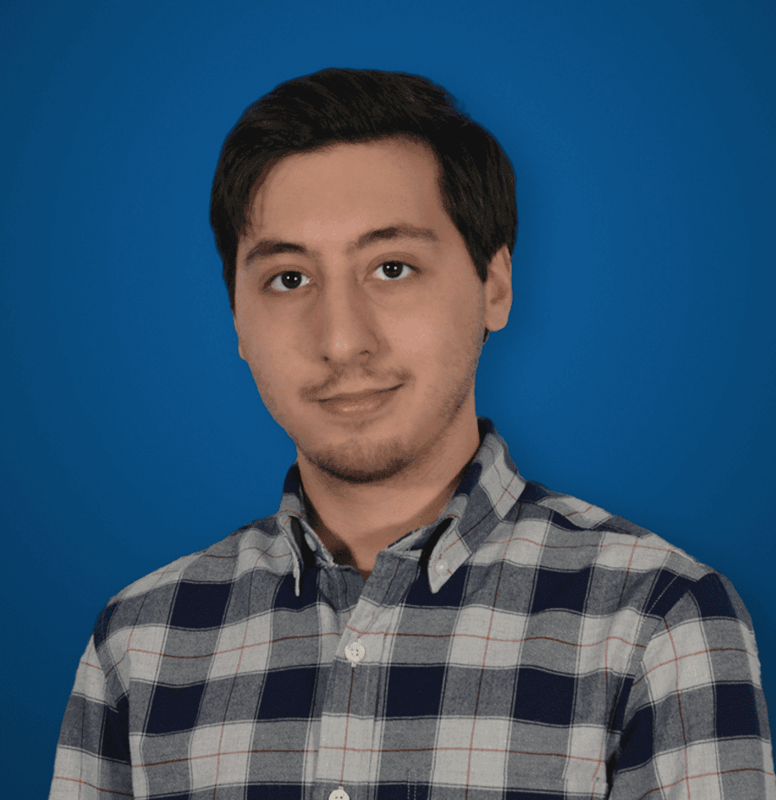 With their hosted solution, 8×8, Inc. ties their features together nicely in the 8×8 Virtual Office – an easy to use platform that combines your phone, with SMS and texting capabilities all in one desktop app. If you upgrade to their Pro plan, you get video chatting, and the ability to host online meetings for workforce collaboration. For a simple 10-line Unlimited Extension Virtual office plan, each line will cost $19.99 per month. Upgrading to the Virtual Office Pro will increase your cost by only $5.00 per line, per month. With only two overall plans, the Virtual Office or Virtual Office Pro, 8×8 doesn’t hide many of the features behind an extra paywall. The Standard plan gives you almost all of the functions you need for your small team to stand out on a level playing field with large scale enterprises, such as Auto Attendant, Music on Hold, Conference Bridge, and Softphone/Mobile app. Upgrading to the Pro plan just gives you can extra set of features that excel the platform beyond simple telephony needs – like the video conferencing, internet faxing, and call recording. Beyond the overall plan, 8×8 allows you to choose between different extension types – Metered for a cost effective solution for teams that don’t make many outbound calls, unlimited extensions to make unlimited calls to the US, Canada and 8 other international countries, and the Global extension for unlimited calls to 40 international countries. With this selection, 8×8 allows for greater flexibility, especially for teams that make a lot of international calls. On the other hand, RingCentral offers three different plans at varying levels, with the option to expand your service with account add-ons like extra toll-free minutes. With their Standard Plan at only $24.99 per user, per month, RingCentral offers an inexpensive entry point to a hosted PBX solution, but unlike 8×8, limits a lot of features to the more expensive plans. 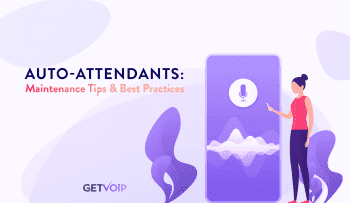 To gain access to helpful features like HD Voice quality, automatic call recording, a multi-level auto attendant, single sign-on or even integration with third party apps, you’ll have to upgrade to the Premium or Enterprise plans. However, what is unique about RingCentral is the flexibility to expand your system to best suit your needs. If your company makes a lot of international calls, add additional international numbers to your account starting at $5.99 a month per user. However, it is important to note that unlike 8×8’s unlimited minutes, RingCentral charges for international calls based on predetermined international dialing rates. Although, each plan does come with its own batch of toll-free numbers, 1000 for the Standard plan, 2500 for Premium, and 10,000 for Enterprise users. You can also add extra international toll-free minutes for $14.99 a month, or a onetime $25 fee. Other expansions include $4.99 a month for additional toll-free or local numbers, and $4.99 a month per user for Global Office users. Logging into RingCentral’s account management page requires your phone number, and extension if you have one, as well as the password for your account. RingCentral doesn’t use a dedicated account username to log in with, but rather your phone number. Upon logging in, you’re greeted with a clean display that clearly outlines the most useful functions. A breath of fresh air, this well designed web page looks really modern and refined. Just in case you can’t find what you need, helpful tooltips popup to display additional information for each link or section you mouse over. The top of the page has links for your Phone System, the default page, Reports, Call Log, Billing, and a drop down tool menu with extras like meetings, appearance, and IVR. The default Phone System screen provides useful Company Shortcuts to edit your business hours, change your greeting, set a caller ID or even publish your Company Info into Directory Assistance. A left sidebar makes it easy to see your number, edit your auto-receptionist, ring groups or specific users as well as phone and devices. 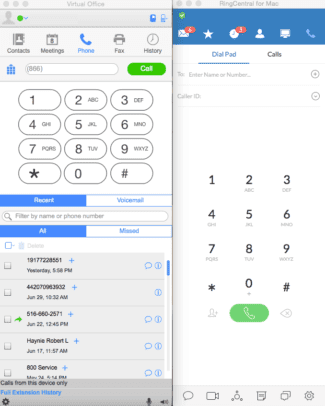 Thanks to RingCentral’s WebRTC support, soft phone access is even provided through the portal with an icon located in the top left, for a pop up window that provides a keypad and display. The bottom of the page also includes quick links to some help articles to guide you further if you need any assistance. Configuring your phone system is fairly easy to do, and all of the options you would need are listed right in the default Phone System homepage, however I had to dig a little bit to find the options. Not until I clicked on the Group button was I able to find options for call queues, IVR menus, and park locations. Clicking on the Company Numbers and Info button lets you access and change your caller ID, address or other information. While everything is there, not every feature is front and center with its own dedicated link, the page feels as if its layered – options are located in other menus that might requiring some digging. Accessing the 8×8 Admin Portal was a little less intuitive than RingCentral. Everything feels a bit old fashioned, and the design is definitely more dated than some competitor’s. With RingCentral, logging into access your admin portal is as simple as going to the homepage, clicking the log in, typing in your account information and you’re brought directly to the Phone System homepage. 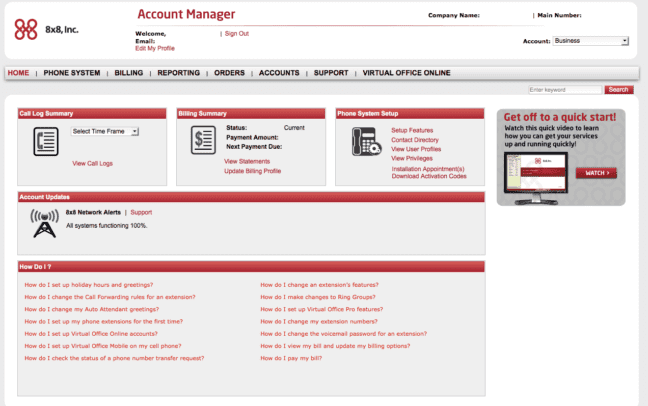 However, with 8×8, you are given the option to access the web version of the Virtual Office desktop app, your Account Management admin portal, or a separate VO Analytics reporting page. This can be avoided by clicking login, then Account Manager instead of My 8×8 Services, but this lead to some confusion my first time accessing the page. Once you’re in, the 8×8 Account Manager is similar to the RingCentral page, but unlike RingCentral, starts you off in a dedicated Home Page. From here you can access your call log summary, billing summary, phone system setup, any 8×8 Network Alerts, and in a similar fashion to RingCentral, a quick access panel for “how to” tutorials in case you need assistance setting everything up. 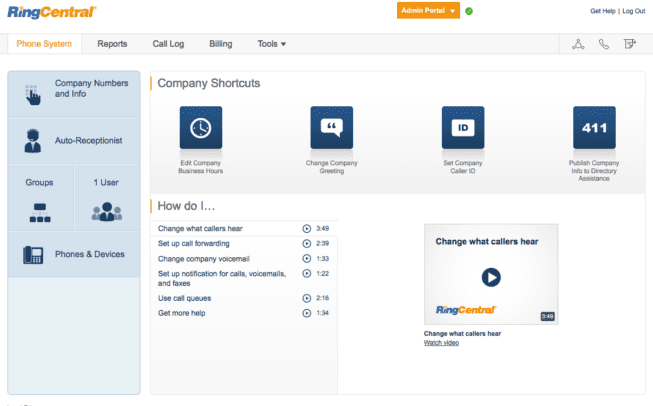 Digging deeper into the other menu options, like Phone System, Billing, Reporting, Orders, Accounts and Support allows you to reach the same pages provided by RingCentral, but options are more visible and not hidden behind extra buttons. The left panel in the Phone System page clearly lists links for extensions, auto attendant, virtual and toll-free numbers, ring groups, music on hold, and even more. It seems like 8×8 took a more function than form approach, the design may not be the best looking but it gets the job done, even if it feels cluttered. However, User Experience is what suffers most – I found myself hunting around for the piece of information I wanted, almost overwhelmed by the vast number of options and information crammed into one page. 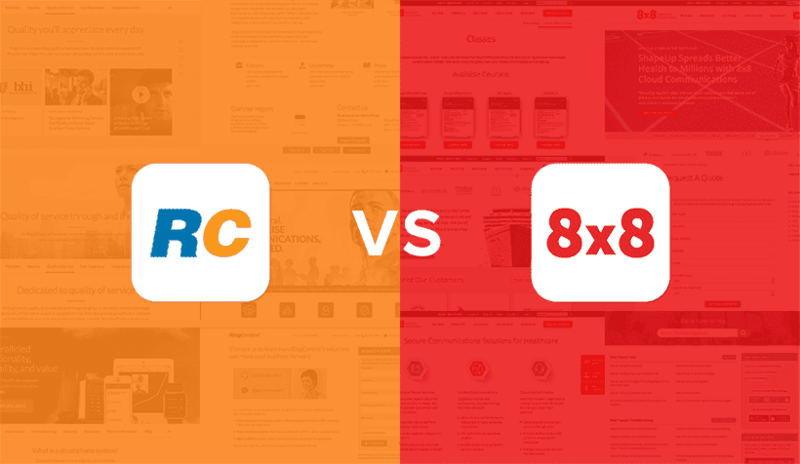 Both 8×8 and RingCentral provide customers with what can be described as a miniature version of their online Account Management portals. These Desktop apps allow you to access similar information, like contacts, meetings, phone, fax and call history for 8×8, and messages, favorites, contacts, a call log and even video chat for RingCentral. The RingCentral app also allows for Glip integration if you chose to leverage the company’s’ Team Collaboration software. In a similar fashion to their web portals, the 8×8 app again feels like an older design, every function has clear labels and designates each icon, and everything feels a bit more cluttered. A recent update freshened up the appearance, but made very minor changes to the layout and interface. On one hand, the abundance of labels means you don’t have to guess what everything else but on the other it all feels like unnecessary clutter. 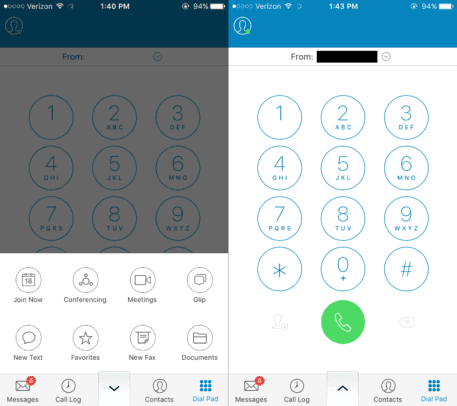 However, the RingCentral app is much more aesthetically pleasing with a blue and white color scheme, and clean flat icons to designate different sections. Again like their web pages, where 8×8 labels each function, RingCentral leaves only the icons for navigation, which can prove tricky at first to those unfamiliar, but provides a much more satisfying and legible user experience. You won’t feel like you’re using an old AOL chat app, as RingCentral sprinkled the app with nice details such as special loading animations for tabs, and the clean modern design. The real reason for these desktop applications are the built in softphone that allows you to make calls directly from your computer. Both apps provide a number pad to dial in, or allow you to type or copy and paste a number directly – this way you cannot accidentally click the wrong number. Again, 8×8 includes the extra information and lets you even see your call history and voicemail while accessing the softphone, which seems useful at first but brings us back to the issue of clutter – there’s too much going on in just one section. However, RingCentral leaves the softphone and call history on separate windows. This doesn’t ruin the functionality of the app, but these little inconveniences slightly compromise the user experience. Both services provide detailed analytics and call reporting to better understand how you and your company use your phone system. Both business phone services allow you to access these report pages through their online management portals, with RingCentral its another section in the standard portal, but with 8×8 the call reports has its own stand alone portal. 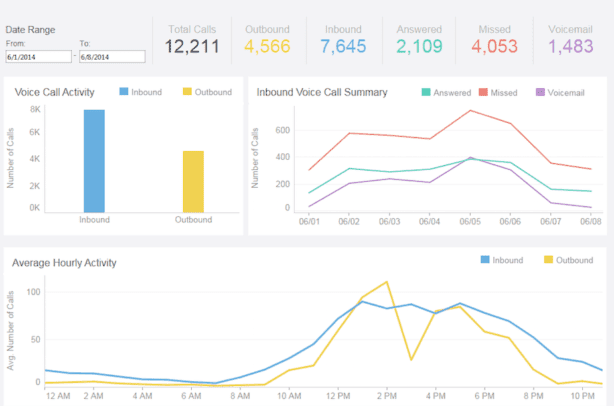 There isn’t too much difference here, each provides you a breakdown of calls made, time spent, answered, missed, out or in calls – both services also provide you with visual graphs to represent the data. You can look at these on a smaller extension basis, or company wide to get an overall idea of the data. In a similar fashion to the other compared applications in this post, RingCentral’s portal feels a lot more intuitive and has a stronger user experience and even provides visuals and graphs. 8×8 has an older style chart to collect all the information. When your business relies on your phone service to be up and running at all times, customer service is key – only second behind the initial reliability of the network. However, even the most robust networks can and do have their hiccups, but also with the nature of VoIP services we sometimes need a helping hand. 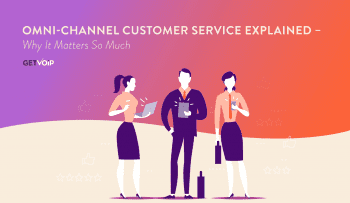 In this day and age, Customer Service can make or break a company, compare provider hold times, and that’s no different for Hosted PBX providers – sometimes you just need to get in touch with a live person to walk you through the issue. Thankfully, both 8×8 and RingCentral have adequate, if not great, customer service, click here to read RingCentral reviews and 8×8 reviews. Both providers can be contacted in a number of ways, from the familiar phone call to support, to quicker routes like instant webchat. Both 8×8 and RingCentral allow you to call their support – but hours are limited from 5 a.m. to 6 p.m. during the week and 5 a.m. to 2 p.m. on Saturdays for 8×8. RingCentral doesn’t specify its calling times for standard users, but does note that Office plans with 2 or more users have access to 24/7/365 support access. Although, RingCentral limits their U.S. based support to only accounts with 20 or more users. Both providers let you log in to access their live web support chat, both provide online e-guides, frequently asked questions, and even video tutorials with quick access in their online account management portals. 8×8 does claim they provide 24/7/365 emergency support, but they don’t entirely specify what would fall into the emergency category. If your phone system goes out I’m sure they’ll help no matter what – but if you can’t figure out how to turn on or off a certain feature you might have to wait until after the weekend. Just like customer service, the network and reliability of your service are key to maintaining as working VoIP service. For Hosted PBX services, it is immensely important to ensure redundancy in a network, with multiple data center locations in varying locations. This redundancy is a built in fail safe for any form of disaster that might otherwise impact one location, and send your entire service offline. With a second, redundant, center in the same location – if one goes down calls can simply be rerouted to the second location and service will continue uninterrupted. In order to maintain a 99.997% up time guarantee, 8×8 hosts its services on 9 different global data centers, located in the US, Canada, Europe, Asia, and Australia, with redundancy. A large global network allows 8×8 to provide its metered international calling as well as unlimited global plans. In addition, 8×8 has a bit of an edge over other providers with its Geo-Routing capabilities. Essentially, geo-routing allows the network to detect your location, and reroute calls to the closest data center. If you are a customer in New York City, and travel to London and attempt to make a phone call from your 8×8 mobile app, the network will recognize you are now in London and redirect your calls straight to the closest UK data center. This differs from other providers that will simply have the call sent to the NYC office, then bounced back to the London office – 8×8’s system removes the extra step. On the other hand, RingCentral provides slightly less information on their data centers. With a 99.999% SLA the network must certainly be robust and redundant enough to handle any form of disaster. However, RingCentral only explains that their data centers are located on the East and West coast of the U.S., and are share facilities space with some of the world’s largest internet companies. RingCentral also explains their “geographically diverse” data centers are ensuring an additional safeguard to minimize the risk of loss, and are collocated with major U.S. telecommunications centers to cut down on latency. To handle the vast number of data flowing in and out every day, up to 1 million voice minutes, these data centers are equipped to handle twice the normal traffic. Both services provide users with an extensive list of calling features normally associated with expensive legacy plans or high end enterprise services. When or how much you pay for the features, though, differs per provider. 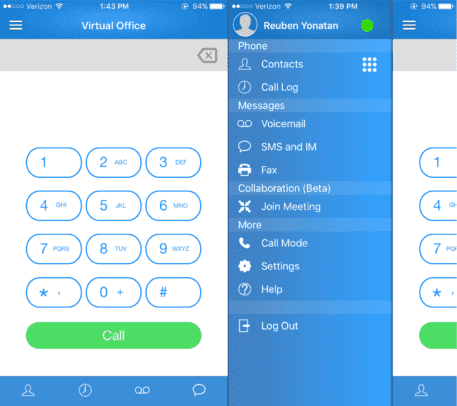 With only two plans to choose from, the Virtual Office and Virtual Office Pro, 8×8 includes all of its calling features in both plans – the Pro upgrade tacks on team collaboration in web conferencing, video conferencing, internet faxing, call recording, team chat and integration with popular CRM software like Zendesk and Salesforce. RingCentral, on the other hand, seems to hide most of its features behind its more expensive plans. The Standard plan will provide you with U.S. based support for 20+ lines, mobile apps, and calling features like unlimited calling, 1,000 toll free minutes, and call log reports. However more robust features such as automatic call recording, multi-level auto attendant, integration with popular CRM software, inbound caller ID name and even HD voice are limited to the Premium plan for $34.99 a month per line – $10 more than the standard plan, and $15 more than an 8×8 Virtual Office line. Although it is worth noting, online meetings, team collaboration, and video conferencing are included in every subscription – RingCentral provides free Glip service to all voice customers. Adding extensions to both platforms can be done through the online management portals, and should only take a matter of minutes. However, echoing my previous experience with the portals, the updated RingCentral design makes for a much easier process involving less clicks. 8×8 provides a separate “Phone System” section on their portal which contains links to view all extensions, edit multiple extensions, change numbers or even download call recordings and outbound calling options. This can be a little confusing at first as I’m unsure why there needs to be a separate link to view the extensions, then another to edit multiple extensions. It seems like most options could be included on one “Phone Extensions” page instead of making users jump between the “view” and “edit multiple” pages just to change more than one phone at a time. However, once you do reach the page to edit your specific line, the portal provides a really comprehensive list of features and functions you have control over, organized by type. Once you get to the page, it’s pretty self-explanatory. The RingCentral portal, on the other hand, makes the process a lot simpler from the beginning. Upon logging in you are greeted with your standard home screen, with the left menu clearly displaying a “Phones &Devices” button which redirects you directly to the “Phone System” page and includes a neat list of every extension and device. Adding a device is as simple as clicking the “Add Device” button at the bottom of the list, and following a short click through menu process. RingCentral does a good job of simplifying the portal and guiding you through the process. Modifying your phone’s settings does not seem to provide an all-inclusive list like 8×8, but rather a guided setup process, similar to adding a new device. In the end, it seems as if it would be hard to go wrong with either provider. However, each shines in its own way. Both providers offer a number of plans to best tailor to your needs, but a distinction can be made between the pricing and features included by each provider. RingCentral offers a large list of features that just isn’t rivaled by other providers, while 8×8 offers everything you’ll need while keeping your wallet happy. The 8×8 portal and apps aren’t as polished as RingCentral, but will certainly get the job done. If price is not a concern, RingCentral with its impressive list of not only features but also integrations provides a powerful and robust solution for almost any business at any size. Beyond the option of three plans, additional addons can further customize the service to exactly how you need it. Those that will utilize the desktop and mobile apps will certainly appreciate their ease of use and modern designs. Not to mention RingCentrals 24/7 service will be beneficial for those that totally rely on their phone capabilities to operate their business. Glip integration is another bonus for the provider with teams that want a full collaboration solution. On the flipside, if you’re looking to keep costs down and only need the more standard features – 8×8 will satisfy your calling needs for less. With their unique Georouting capabilities, 8×8 definitely stands out a bit more for those businesses that require a stronger international presence as well. Although it is important to note, users who require call recording, internet fax and call queuing will have to pay more for the added features, so the price difference might not be as drastic as it seems between the two. But with unlimited minutes and all the basic VoIP features your business will need, 8×8 can help keep your system and bill a bit simpler.